Welcome to the 2016 hennemusic Rock News Awards. The Red Rocker began 2016 with the launch of "Sammy Hagar's Rock 'n Roll Road Trip" on AXS TV in January, which saw him hook up for interviews and jams with fellow artists including members of Motley Crue, the Grateful Dead, Heart, Alice In Chains and others. Hagar next made headlines in late January when he tweeted a message to former bandmate Eddie Van Halen on the occasion of his 61st birthday. The exchange may well have marked the first contact between the two since they split at the end of a 2004 Van Halen reunion tour, and was enough to begin fan and media speculation about possible further reconciliation. Hagar discussed his life and career in February while promoting his television series with an appearance on AXS-TV’s The Big Interview with Dan Rather, where he delivered an acoustic performance of a brand new song called "Inner Child." In May, the singer joined supergroup Chickenfoot for a pair of concerts in Lake Tahoe, NV that marked the first time in over six years that he, guitarist Joe Satriani, bassist Michael Anthony and drummer Chad Smith have regrouped to perform a full show. Chickenfoot debuted a new tune, “Divine Termination”, at both events before Hagar and Metallica's James Hetfield hosted the third annual "Acoustic-4-A-Cure" benefit concert at The Fillmore in San Francisco, CA on May 15. 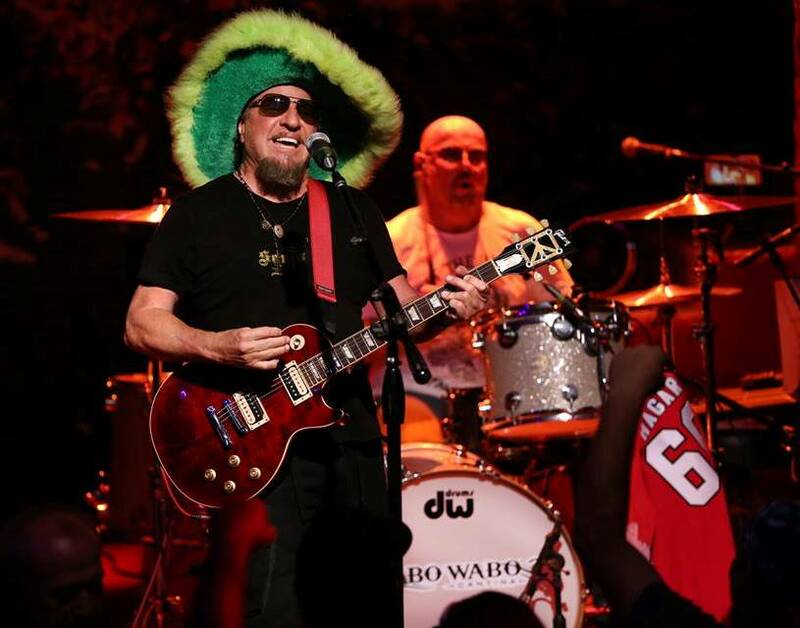 Hagar and his latest supergroup, The Circle – which includes Anthony, drummer Jason Bonham and Waboritas guitarist Vic Johnson – launched a series of summer US shows in June. Sammy joined country superstar Kenny Chesney to perform his signature 1984 hit, “I Can’t Drive 55”, before 50,000 fans at Levi’s Stadium in Santa Clara, CA on August 6. Hagar has repeatedly bashed the band at every turn since his 2004 departure, but following the late 2015/early 2016 deaths of fellow rockers Scott Weiland, Lemmy, David Bowie and Glenn Frey, he told Oprah that he has found himself in a new place. The singer marked his 69th birthday in October with his annual series of shows in Cabo San Lucas, Mexico, where he was joined by guests including Jerry Cantrell of Alice In Chains and Hellyeah’s Vinnie Paul, among others. The same month, Hagar joined Maroon 5 singer Adam Levine’s team on NBC’s The Voice as a guest mentor, offering advice to some up-and-coming singers as part of the long-running reality series. Throughout the year, the Red Rocker has been conducting interviews for Season 2 of "Sammy Hagar's Rock 'n Roll Road Trip", including chats with John Mellencamp, Toby Keith and ZZ Top guitarist Billy Gibbons. Broadcast details regarding the second round of the series have yet to be released. Hagar will kick off 2017 as his bar in Cabo San Lucas, Mexico with a Flashback Friday 80’s Extravaganza concert on January 6 where he’ll be joined by Loverboy.